Celebrate Scranton’s Charter Day with Coloring Pages! Comments Off on Celebrate Scranton’s Charter Day with Coloring Pages! This Saturday is Charter Day, Scranton’s celebration of the 150th anniversary of its incorporation as a city. There will be lots of events going on all day, but here’s another festive option for creative Scrantonians: Charter Day Coloring Pages! These Coloring Pages were a collaborative effort between the Lackawanna Historical Society, the Lackawanna Valley Digital Archives, the Leadership Lackawanna #HistoricScranton team, and the University of Scranton Weinberg Memorial Library (we had way too much fun working on our Local History Coloring Book back in February and couldn’t resist coming back for more!). The pages feature images of the city and its past. 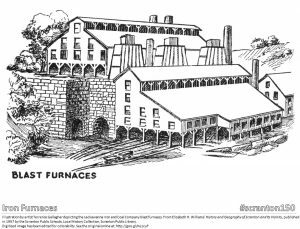 Leadership Lackawanna’s #HistoricScranton coloring pages, created as part of a current class project with the Historical Architectural Review Board, highlight historic buildings and architecture. The remaining pages hold digitized drawings from local history collections housed at LHS, the Scranton Public Library, and our own University Archives and Helen Gallagher McHugh Special Collections. (We also included a few images from books digitized by other libraries that are now in the public domain.) Each digitized image is accompanied by a citation describing the image and its source. LHS will be printing out pages for coloring contests to be held throughout this week, but you can also download a digital copy and print out your own. Happy coloring, and happy birthday Scranton! Many thanks to all our partners, and extra special thanks to our Weinberg Memorial Library students and staffers who helped with selecting images and making them coloring-friendly! Tomorrow morning at 9:15 am, the City of Scranton will kick off its year-long Sesquicentennial Anniversary Celebration. Scranton was incorporated as a city on April 23, 1866, so next spring (April 23, 2016) will be the city’s 150th birthday. While the University of Scranton itself wasn’t around back at the very beginning (founded in 1888, we just celebrated our 125th anniversary in 2013-2014), we’re proud of the close ‘town and gown’ relationship we’ve had with the city of Scranton throughout our shared history. Here at the Weinberg Memorial Library, we’re looking forward to joining in the fun throughout the anniversary year. Beginning in May, each month of the City celebration will highlight a decade (or two) in the city’s history, and here on our Library blog we’ll be highlighting how the University grew alongside the city during that time. Our University Archives and Helen Gallagher McHugh Special Collections include many rare and unique resources related to the history of the City of Scranton, its residents, and its major institutions. For example, the Library holds the records of the International Correspondence Schools of Scranton – and in the fall, we’ll be exhibiting materials from this collection in celebration of the 125th anniversary of ICS (now known as Penn Foster), which was founded in 1891. We’ve been working on digitizing archival and special collections materials and making them publicly available for searching and browsing in our digital collections, but there’s always more to do. We’re currently tossing around new ideas for increasing public, digital access to local history materials with some of our friends on campus (the History and Communication Departments, Royals’ Historical Society, Hope Horn Gallery, and Community Relations) and in the community (the Lackawanna Historical Society, the Everhart Museum, Scranton Public Library/Lackawanna Valley Digital Archives, and Marywood University). More to come on this as our plans develop! At the state level, we’re collaborating with other academic and public libraries on a broad initiative to establish a Pennsylvania service hub for the Digital Public Library of America, which will make Pennsylvania history and cultural heritage more accessible and discoverable to students, teachers, genealogists, historians, scholars, and others in our communities and around the world. So happy birthday, Scranton! Let’s get this party started.